Description: Eastern Americas and West Indies. Decorative black and white cartouche. Description: Beautiful chart of the Atlantic showing Western Europe, Eastern North America, Central America and Northern South America. One of Coronelli's masterpieces. Description: Atlantic Ocean showing sailing route from Europe to the West Indies. Coloured sea chart. 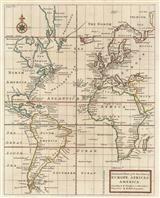 Description: Beautiful chart of the Atlantic including the Americas and West Indies. Coloured. Description: Atlantic Ocean showing the sailing routes from Spain and Italy to the West Indies. Decorative cartouche. Description: South Atlantic. Map shows voyages of Eduard Lopez. Coloured. Description: The South Atlantic, illustrating the area relevant to the activities of Antony Knivet. Coloured. Description: Scarce and unusual map in original outline hand-colour showing English possessions in North America. Restoration to central fold and lower margin. Description: Atlantic Ocean showing the coasts of the Americas, Europe and Africa. An attractive sea chart with compass rose. Coloured. Description: Attractive and detailed map of the Atlantic Ocean with text describing differing sea currents and winds. Coloured. Description: Striking large sea chart of the Atlantic. Coloured.